Hello readers! As much as the health craze has taken over the country, with the likes of oatmeal, grains, and herbal shakes featuring heavily in our daily routines, every once in a while you just need to fulfill your breakfast hunger on the way to work. This is the bread and butter of the fast food industry (pun intended), and shows no signs of going away soon. 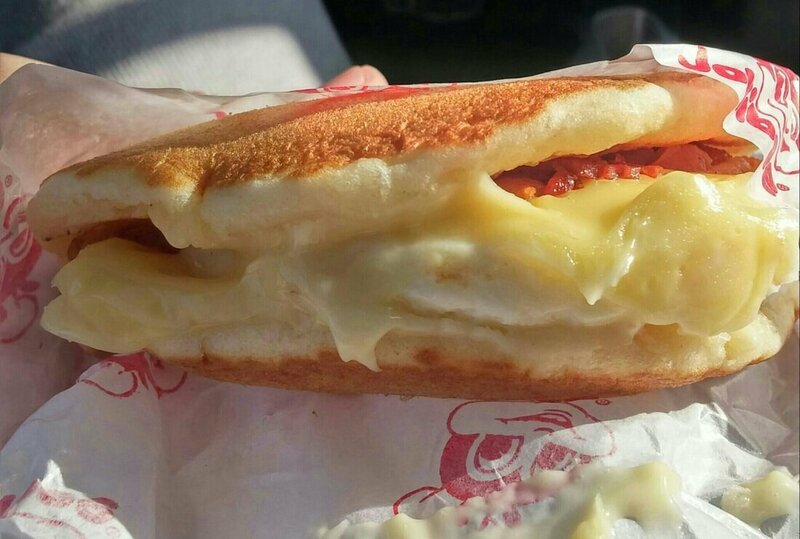 The Pancake Sandwich (Php 50) is one of the breakfast offerings of our beloved Jollibee. Housed between two small pancakes are a sunny-side-up egg, a slice of melted cheese, and my favorite breakfast food in the whole wide world BACON. The pancakes were nothing special, but not bad either. The egg was cooked a bit too much for my liking, as it would have provided some much needed runny-ness if it had been cooked a bit less. The cheese was unspectacular. The bacon I found lacking, as there were bites without any. Plan your bites accordingly, guys and gals! For 50 pesos though, you could be doing a lot worse. Next time, I should probably try it with pancake syrup to add some more flavor (and calories too!). It is filling enough that having this for breakfast might get you to morning merienda, maybe even lunch if you are on a diet (in which case you probably should not be eating food from Jollibee). What is your favorite breakfast when on-the-go? Do you have other thoughts regarding the Pancake Sandwich? Let us know via your comments!